Prior to the Nexus Masterclass 2012 “Faith in American Politics” by E.J. 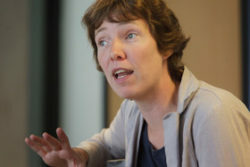 Dionne, Nexus Connect entered into debate with Kirsten Verdel (1978), political scientist, politician and writer. During the 2008 American Presidential Election, Verdel was the only foreigner working at the national headquarters of Barack Obama’s Democratic Party. With Nexus Connect, she discussed campaign strategies in the US and the Netherlands, as well as lies, truth and the game of politics.